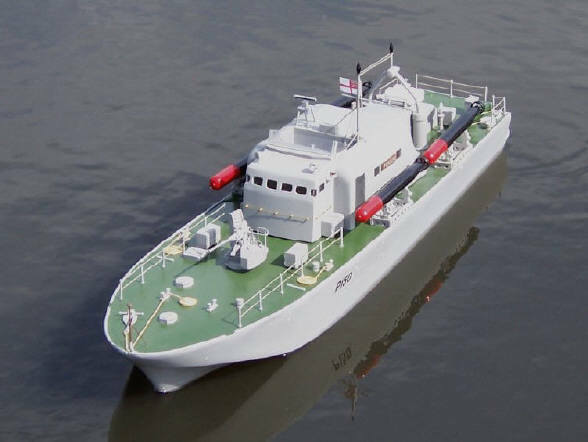 Perkasa fast patrol boat. Built by Peter Bryant of Salisbury. This is my first attempt at radio control model boats. Thanks to members of the Waterside Model Club in Fawley I have now managed to achieve good performance. It runs on a single Graupner 600 motor. I have just completed and test flown a hovercraft that I have built. This is my first attempt to build a hovercraft. 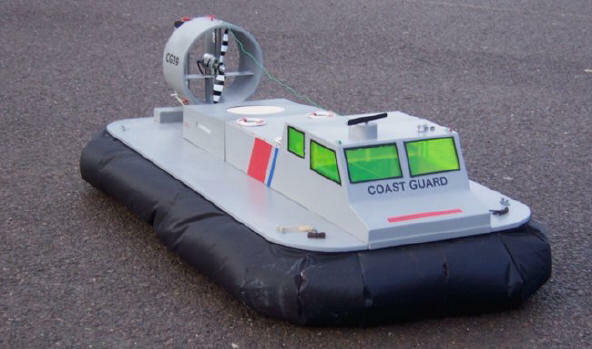 It was built from plans which I obtained from the Model Hovercraft Association of which I became a member. Other members of the association helped me overcome some of the many construction problems. It is based on the hull of a Griffin hovercraft, but the cabin is of my design. Building a hovercraft is quite an experience as is flying it. It is also something people tend to look at twice. So far I have only operated it on concrete and am really looking forward to getting it on water. From all accounts it is a different ballgame on water so it looks even more interesting. There were two main problems I came across. One was making the skirt as sewing is something I leave to the wife. As she likes dressmaking, she was keen to help. The other problem is storage. As my wife had put some effort into making the skirt she could not object to it being kept on a bed in one of the spare bedrooms. Well that's what I like to think!! !